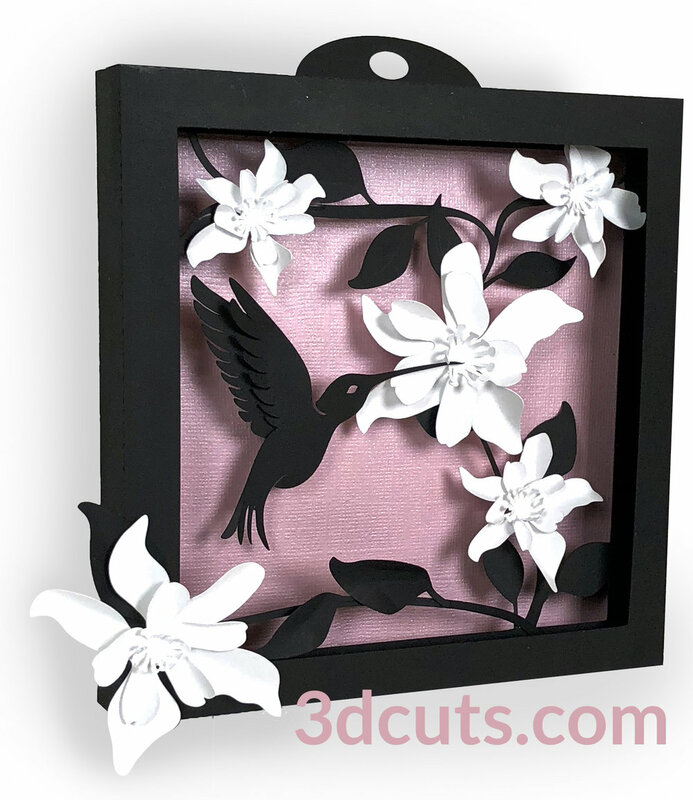 This tutorial is for the 3 layer Hummingbird shadow box designed by 3Dcuts.com. The assembly process is similar to many of the shadow boxes I have designed but this one has fewer layers and more added details. This shadow box is about 6 1/2" square when complete. It comes with an optional hanger if you want to hang it on the wall. It is about 7/8" thick and can also stand on a shelf. The impact can be dramatically changed by using different background papers. The assembly is easy and basic 3d construction. Cutting File available at here from 3dcuts.com. 8.5 x 11" card stock - I used the 65lb Cardstock from Recollections available at Michael's. Adhesive - I use Scor-Tape, Art Glitter Glue, and glue dots although other adhesives would work. Back Ground paper: Be creative- Paper needs to be cut to 6 1/4" square. Special Note: I update the instructions online. Check at http://3dcuts.com/hummingbird-shadow-box-tutorial for adjustments and additional information. Don't just rely on the pdf file that comes with the download. Learned hints and corrections are added to the the online tutorial. 1. Download the cutting files for your cutting machine at here from the 3dcuts.com store. You can also download a variety of skies to print from 3dcuts.com. Here are the various pieces you will be cutting out. A mat in good condition is also important. I use the Nicapa mats from Amazon Nicapa Cutting Mat (Affiliate Link). You need to use one that still has a lot of stick to it. It helps hold the paper, prevent tearing and assists in separating. I find settings vary by blade but I use the premium blade, set for heavy card stock and modified on the Silhouette to a depth of 4, speed of 4 and pressure of 33. You can start there but you will probably have to vary it for your blade. It can help to slow the speed down on the more complex cuts. I reduce the speed to 2 on the more complicated pieces like the hummingbird and the flowers. Here you should be creative. I have created backgrounds by doing a water color wash, creating a gradation on the computer, acrylic paints, or buying cloud paper.